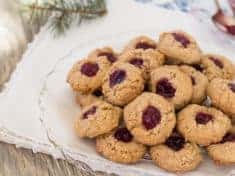 Almond cranberry thumbprint cookies are some of the easiest holiday cookies to make–7 ingredients dirty just 2 bowls, one for maple syrup and oil, another for the flours, cinnamon, and salt. The finger indents are filled with cranberry jam, which is simply a thickened cranberry sauce. 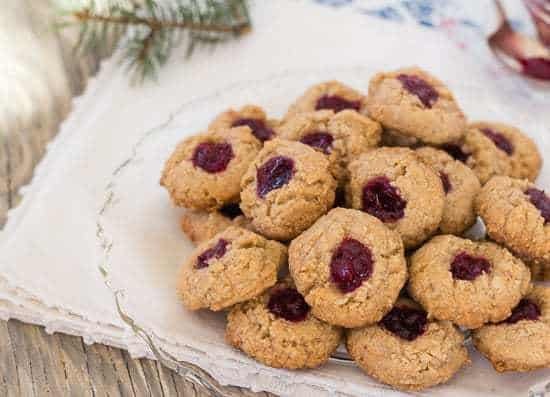 Made with equal parts almond flour, oats, and flour, naturally-sweetened with maple syrup and a judicious pinch of cinnamon, egg and dairy free, these ruby-jeweled wholesome cookies will charm their way into your life. These thumbprints have a rustic quality and at the same time strike you as dainty, with that sweet-tart jam peeking out of the centers. I swear after a few days in an airtight container, after the moisture from the jam softens the dough, they taste even better. Which also makes them good make-ahead keepers. If you’ve got cranberry sauce leftover from Thanksgiving dinner but it’s a bit runny, reduce the sauce with a quick stovetop simmer. This recipe includes directions for making a small batch of thicker (less water) cranberry sauce. 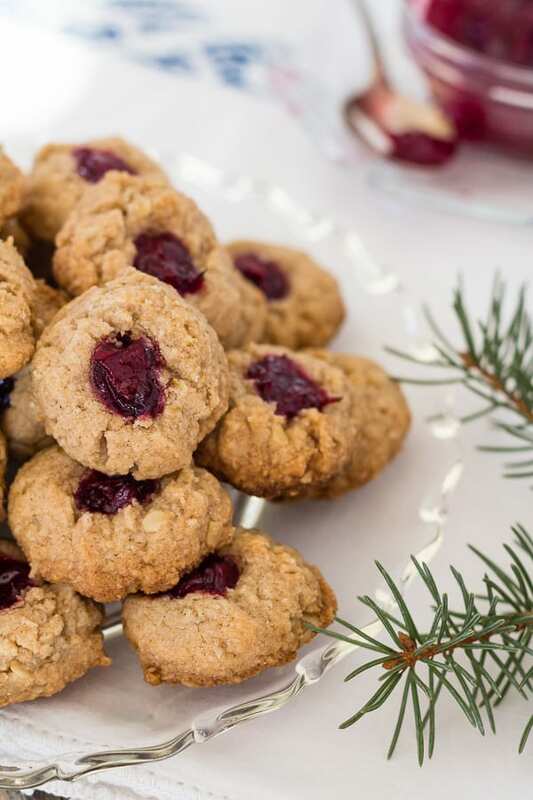 You can fill thumbprint cookies with raspberry or apricot jam, or whatever you have on hand. 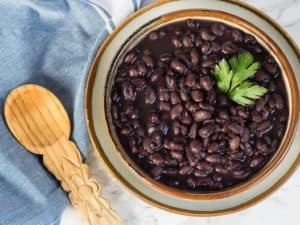 No almond flour? Grind almonds in the blender or food processor along with the oats. Feel free to substitute gluten-free flour for the white whole wheat flour. 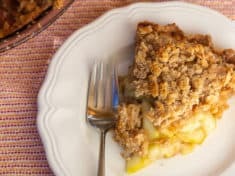 Adapted from Natural Foods Cookbook by Mary Estella. 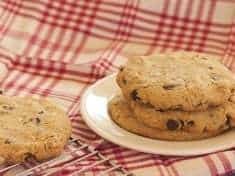 You might also enjoy these gluten-free chocolate chip almond cookies. These little gems keep and travel well. You can fill the thumbprint indents with any flavor of jam, not just cranberry. Makes about 40 small cookies. Heat water and maple syrup or sugar in a saucepan, stirring until it comes to a simmer. Add cranberries, and cook until the cranberries pop and break down, about 10 minutes. Mash with a potato masher or fork so there are no large cranberry pieces. Set the mixture aside to cool. Mix the ground oats, almond flour, whole wheat flour, cinnamon, and salt in a bowl. In another bowl, whisk maple syrup and oil together until smooth. Stir into flour mixture until well blended. Form dough in 1-inch balls, using a rounded teaspoon (or #100 cookie scoop) to measure. 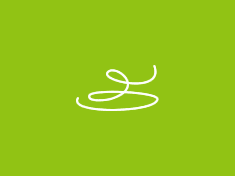 Arrange about 1 ½ inches apart on baking sheet lined with parchment or silicone baking mat. 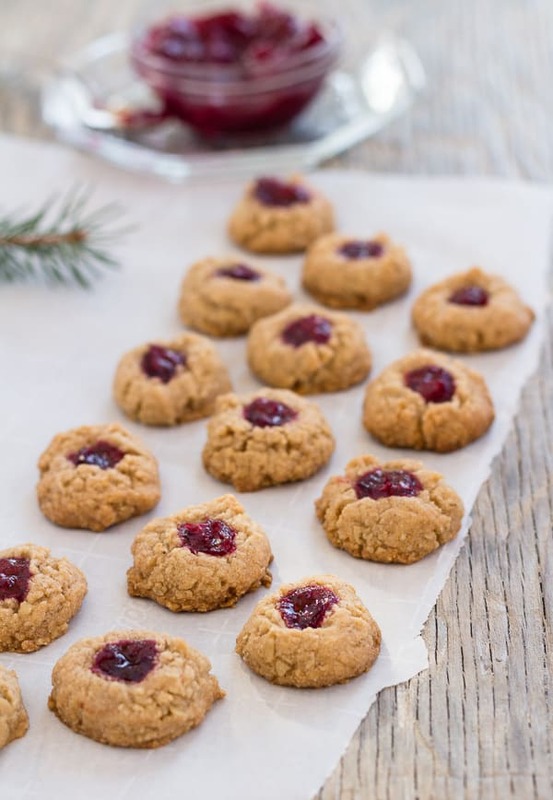 Gently press your pointer or pinky finger in the center of the cookies, creating space for the jam. 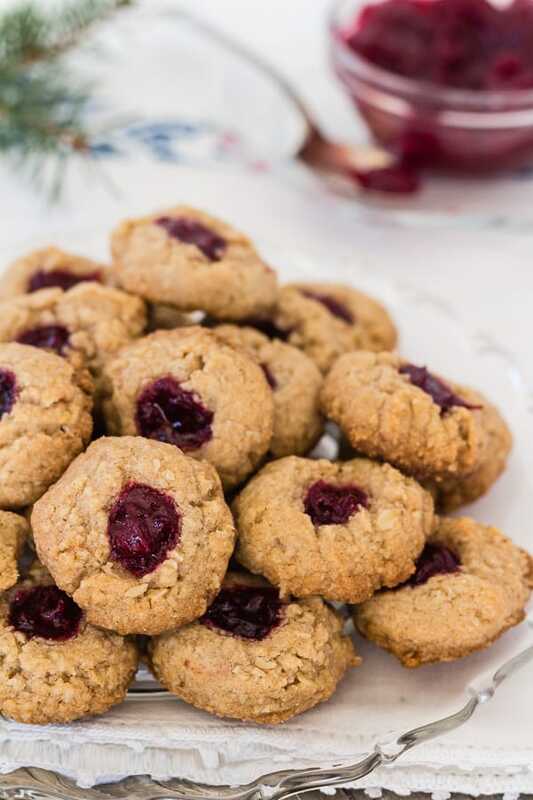 Fill each cookie with scant ½ teaspoon cranberry jam, dropping from a spoon, or if you have pastry bag skills, pipe the jam into the indentations. 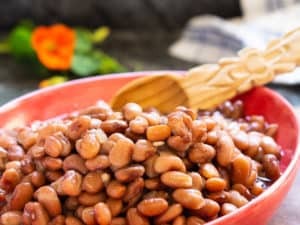 Bake 10 to 15 minutes, or until light golden brown on the bottoms.